Before heading to the store, be sure you have a list. Mark categories: veggies, fruits, proteins, frozen foods, dairy, grains and fats. Try to include at least one new food a week in each category. For instance, if you bought salmon last week, try another fish, such as haddock or swordfish. All foods have different nutritional components, and your list should vary so your body doesn't get too used to one way of eating. Making a list will eliminate buying sugary, processed food you don't need. Try including one item in your cart that you will enjoy in moderation, such as organic dark chocolate. When focusing on weight loss or muscle gain, you should consider your calories in versus calories out. When you prep your food in advance, it's a sure way of knowing what you are consuming. Preparing your own meals will give you insight into what a true portion of food is. Remember that you don't have to spend hours in the kitchen for meal prep to happen. Focus on one thing at a time, and nail it before overwhelming yourself with everything all at once. If you want to ensure that your breakfast is a priority, focus on prepping some breakfast items such as egg cups, oats or a pre-made protein shake. Have vegetables pre-washed and cut; and the same goes for fruit. 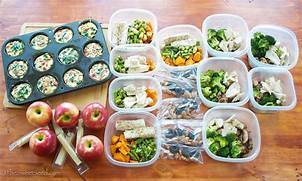 Start small: Once you master one small task, you will feel confident in moving on to prepping meals for an entire day.